IVR diagrams visualize the logical and physical structure of IVR systems, where computer interact with callers using of voice and dual-tone multi-frequency signaling (DTMF) keypad inputs. They are used to develop, operate and maintain the IVR systems for inbound and outbound call centers and voice mail systems. ConceptDraw has 1004 vector stencils in the 40 libraries that helps you to start using software for designing own Cisco Network Diagrams. You can use the appropriate stencils from Interactive Voice Response library with 35 objects. Design Elements — IVR (Windows, Macintosh). ConceptDraw solution Computer and Networks provides Interactive Voice Response library of 35 vector stencils for drawing the IVR network diagrams. Use these libraries of design elements to visualize the logical and physical structure of IVR systems for inbound and outbound call centers and voice mail systems. Network community structure is a network which nodes can be easily grouped into the sets of nodes with dense internally connections. This example shows a network that displays the community structure with three groups of nodes with dense internal connections and sparser connections between the groups. ConceptDraw solution Computer and Networks provides Interactive Voice Response samples, templates and library of 35 vector stencils for drawing the IVR network diagrams. 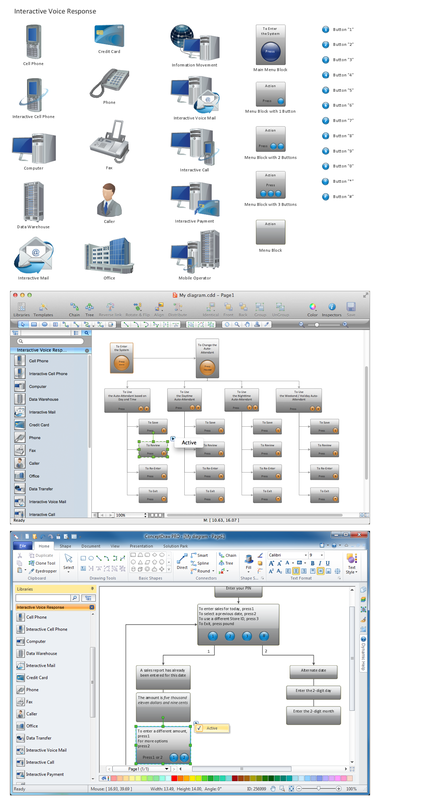 Use ConceptDraw DIAGRAM v12 diagramming and vector drawing software enhanced with solution Computer and Networks to visualize the logical and physical structure of IVR systems for inbound and outbound call centers and voice mail systems. The CCTV is the process that carried out using the video cameras for transmitting the signal to the specific location, on the limited set of monitors. We are talking about the video cameras that are used for monitoring on such guarded objects as airports, banks, stores, military objects, etc. CCTV equipment is also used in the industrial installations, for surveillance in the public places, for recording the video on the digital video recorders. ConceptDraw makes the entire process of network visualization easier thanks to the numerous ready-to-use objects included in the package for presentation of network equipment, LDAP directory symbols and many other objects that symbolize resources in most various representations.